HAPPINESS...that is what this mask brings to your face! I fall in love with all these products I make, but this one had me so enamored I used it three days in a row. If glowing, beautiful, youthful looking skin is what you're after, this is your go-to mask. HAPPINESS is made with green French clay and lead-free turmeric to give your skin a good, deep purification and to leave you shining like the sun. Turmeric powder is bright yellow in color and immediately attacks your cells to eliminate any kid of inflammation. Turmeric is superbly healing and will impart a natural glow to your skin. French green clay works to pull impurities from your skin and balance out any overproduction of sebum. 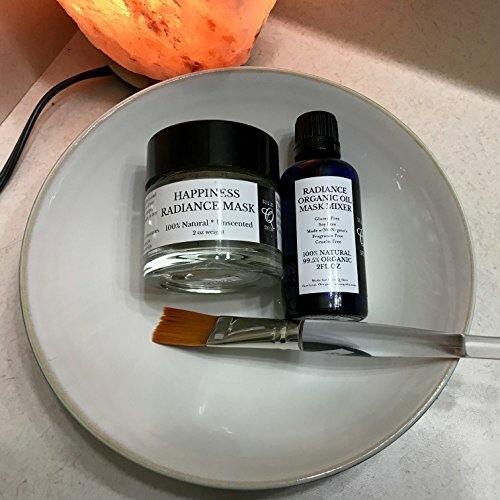 Radiance facial mask works by deep cleaning your pores, brightening your complexion, and physically removing dead skin with our organic ground grape seeds and ground coconut shell. We add in aluminum-free sodium bicarbonate to work both as an exfoliant and to reach deep into your pores. Ascorbic acid rounds out this power-packed mask. Ascorbic acid is a very active form of vitamin C to help brighten skin and boost collagen production. Mix about 1tsp of each (powder and desired liquid) in a bowl. Should be spreadable and not too runny. Apply to face, including under the chin. The best place to remove this mask is in the shower as the turmeric can stain towels if not washed off completely. You can remove using a facial brush, washcloth, or hands. Work the mask off by going in circles. Make sure to get from your hair line down to your neck. Rinse thoroughly to remove all the grape seed, coconut shell and turmeric. If you rinse the mask off in the sink, just keep rinsing until the water runs clear. The turmeric will be bright yellow in your water, so it will be easy to tell. Do not use any soap or non-oil cleanser to remove the mask. You will imbalance your pH and reduce the effectiveness of the mask.